An old busted stereo, creaky floorboards that sing with every step, and four small walls with a sturdy roof. It was all given to me within the first five minutes of Animal Crossing and I don’t think I’ve had a happier moment in a game since. The first time Tom Nook gave me the keys to my own little slice of life was the first time I truly felt relaxed in a game. 2002, the year Animal Crossing: Population Growing came out in North America, may feel like a lifetime ago but the memory still pops into my head every now and then almost 17 years later. While Nook, the friendly face of Animal Crossing capitalism, did urge me to start working to pay off the loan he conveniently took out in my name so I’d have a place to sleep, there was no interest being charged, no deadline, and no real pressure to get it done. That feeling is so foreign looking back at it today. I rarely feel like I have any time to set my responsibilities aside and just... breathe. Burnout – or the feeling of chronic fatigue brought on by a feeling that we must always be working – absolutely dominates the video game industry today. Everyone from Overwatch League pros to indie developers, as well as the majority of millennials, suffer from it. If I ever get a few moments of downtime I feel incredibly guilty that I’m not using it to catch up on missed work. There's a good chance that you probably feel the same way too. That notion isn’t just harmful, it’s antithetical to living a happy and healthy life. If we do anything in 2019, we need to take a step back and realise that no matter how much we feel we need to work, we need to rest and enjoy the company of our loved ones even more. While that may seem easier said than done – especially for individuals that have families to support – Animal Crossing is the perfect game to find peace in. The game is designed around relaxation through simple progression, presented through a villages that's full of calming tasks that can take your mind off of the real world. It’s more than that though – there is an emphasis on slowing down and relaxing for the sake of relaxing. 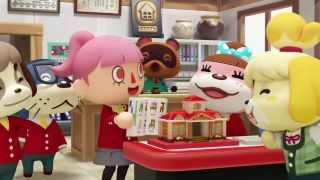 At the core of the series, Animal Crossing is all about slowly making headway through the game’s variety of systems, including adding new rooms to your home by raising money, filling out the museum by catching bugs, fish, and fossils, as well as building friendships with other villagers through everyday interactions. "But, outside a few rude comments from neglected villagers, there is absolutely nothing in the game that tries to push you to get things done"
But, outside a few rude comments from neglected villagers, there is absolutely nothing in the game that tries to push you to get things done. Stores close at regular hours to discourage late night work sessions, fish and bugs only come out in certain parts of the franchise’s real-time season system, and Nintendo’s trademark 'you’ve-been-playing-too-long-so-take-a-break' messages originated in the animals’ dialogue. Even the collectibles are relatively stress-free. There isn’t an-easy-to-find counter that tells you how many bugs, fish, or fossils you had left to collect. The most stressful part of the series is when I tried collecting all the fish, fossils, and bugs as quickly as possible, and the worst example of this was the scorpion. The scorpion is one of the rarest bugs in Animal Crossing's 3DS adventure New Leaf. It doesn’t fly around, sit on a tree, or spudder off when you walk close to it – in fact, it attacks you if you approach it with a net. You’ll get sent home with a nasty sting if you get too close. Its spawn rate is so low that you could scour the town during the summer months, when the bug is out and about, and come up with absolutely nothing. I’ve done this too on several warm summer nights after 7pm when the little beast emerges from its hole. I’ve walked from the beach to downtown, waterfall to town hall, and everything in between hoping to catch a glimpse of the little scoundrel. Looking for something new to play while you're waiting for Animal Crossing Switch? Why not check out our list of the best Nintendo Switch games. Absolutely no luck came my way – I gave up and turned the system off. I wanted to catch a scorpion, but I didn’t want it, or any other menial task in Animal Crossing, to be the focus every time I hopped on so I decided to forget it and focus on having fun. A few weeks later on an crisp Sunday in August, I booted up my 3DS late in the evening to catch the summer fireworks show. I strolled across town watching the colors erupt in the sky – no net, no worries. I stopped for a second alongside the river to throw out my fishing line and that’s when I saw it. A scorpion was about fifteen paw prints away from me; I didn’t go out looking for it and it certainly wasn’t looking for me, but we found each other. Adrenaline, which is a sad rush to get when playing Animal Crossing of all things, fueled me as I got out my net and rushed the tiny monstrosity. Normally you’d want to sneak up on it if you could since the difference in seconds between catching the thing and getting stung is tiny. I thought I’d had my lucky break – it didn’t see me so I could quickly swoop and score. Luck was on my side that day as I scooped up the scorpion in my crusty old net. Now, if I had spent hours hunting down the arachnid and finally caught it, I would probably have put the game down or moved on to the next item on my checklist (which is, arguably, worse). Instead, it all happened by chance and I was refreshed and excited by the chance encounter. I took a break from my self-imposed, in-game obligation and something great happened as a result. It’s possible that it was all luck, as some players will stumble across a scorpion in their first few days of playing while others will spend weeks finding one. But either way, taking time for yourself in real life can reap a similar benefit. Recharging your batteries can prepare you for the next opportunity – be it a sudden idea that helps you overcome writer's block, solve an issue at work, or help in your family life. The scorpion was my issue and it resolved itself with little effort on my part. Sometimes, it’s important to step away and come back with a fresh head to tackle life’s problems; Sometimes, in life and in Animal Crossing, that's all it can take to make a challenge that much easier to overcome. It’s fitting that we will be receiving Animal Crossing Switch in 2019 – it means we will have the opportunity to confront and tackle burnout inside of Animal Crossing how we want to and whenever we need to. Everyone should take some time to slow down, this year and always, even if that means the scorpion – your scorpion, however it may manifest – will have to wait a little longer to get caught.